A small private hotel 'Juzhnyu Bereg' is in the centre of Alushta city in 300 m far from the sea.It is situated in a favourable place near the orthodox church. There are different categories of rooms with large balconies and posh view of the sea and mountains at Your disposal.There are fridges, air-conditioners, colour television with cable TV sets. Bathroom units are equipped with lavatory pans, washstand, shower cubicle with twenty-four-hour hot and cold water supply. Description of the room: In the room: sofa (possible accommodation of the second person), balcony (view of the city). Description of the room: Two separate rooms, in the room there is a double bed and a sofa. Possible accommodation of the fourth and fifth person on a cot, a terrace (view of the sea and mountains) with a corner for relaxation, and a balcony overlooking the city. Description of the room: Double bed. Possible accommodation of the third person on the cot, balcony (view of the city). 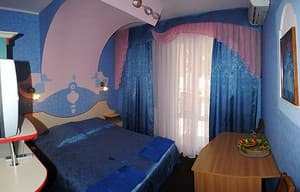 Description of the room: In the room: double bed, loggia (view of the sea and mountains) with a corner for relaxation. Description of the room: Room with a double bed (view of the sea and mountains). Possible accommodation of the third person is a clamshell. Description of the room: The room is divided into two rooms by a partition. 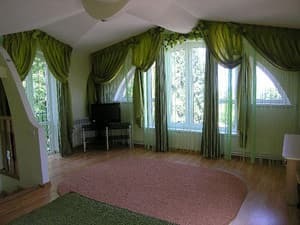 In the room there is a double bed, there is a possibility of accommodation of the third and fourth person - 2 armchair-beds, balcony (view of the city). Description of the room: Cottage in two levels. 1 floor kitchen-dining room, c / a; 2nd floor - bedroom. 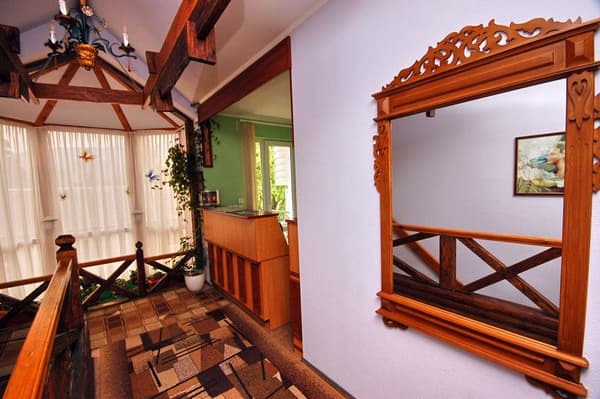 The cottage is equipped with modern appliances and comfortable furniture. The cottage can accommodate 4 people (double bed and sofa in the kitchen-dining room). Хорошее месторасположение, чистый номер, вежливый персонал. Номер выходил на оживленную улицу. слышимость; для номеров 5,6,7 лоджии совсем рядом, разделительная стенка небольшая, неприятно находится, когда кто-то в метре от тебя курит. Children under the age of 6 without providing with an extra bed are accommodated for free. 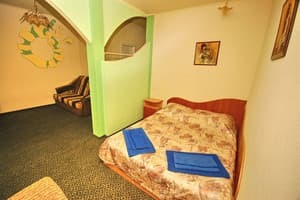 An extra bed is provided for above board of 50-80 hryvnas (depending on the season). 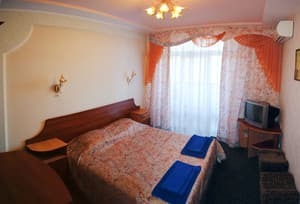 A small private hotel 'Juzhnyu Bereg' is in the centre of Alushta city in 300 m far from the sea.It is situated in a favourable place near the orthodox church. 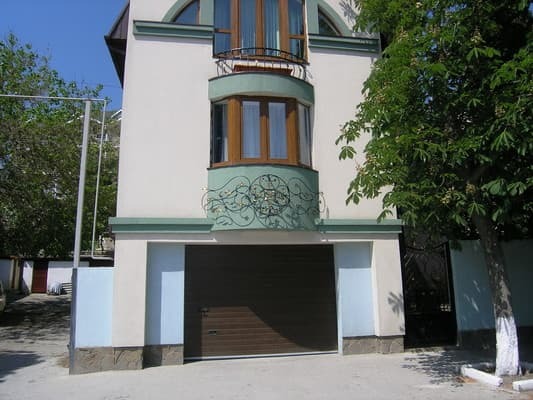 The nearest railway station to Alushta is in the city of Simferopol (45 km). From Simferopol to Alushta: near the railway station (exit to McDonald's, in the direction of the tower with a clock) are auto- and trolleybus stations. From there, by shuttle bus, shuttle bus or trolleybus No. 51, No. 52.